The visual represents the new/recommended PUL/PCLs in snapshot form. Each quadrant is one of four components that IUPUI students will develop throughout their undergraduate experience. Students will be introduced to each component in general education and co-curricular activities, have multiple opportunities to practice and refine each component in major coursework and additional co-curricular activities, and approach proficiency in culminating experiences. 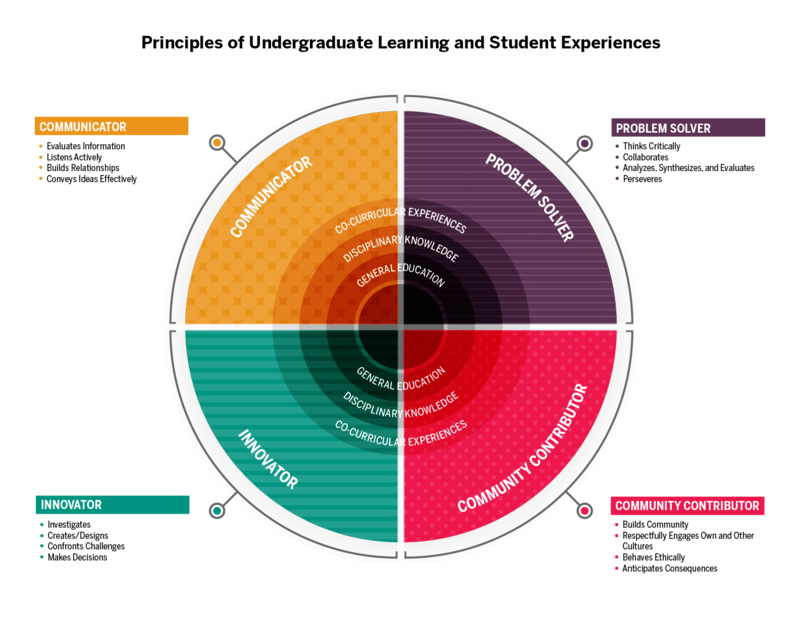 Imagine each quadrant with an arrow or spiral emanating from the center of the visual and moving to the periphery as students navigate various experiences toward graduation. As you read through the entire document, each quadrant is explained and defined in some detail, while still providing flexibility for each unit to codify how students will demonstrate proficiency. We provide outcome statements, example assignments/activities, and example assessment mechanisms. Individual units may provide additional information in these sections. The four quadrants represent what we aspire for our students to acquire during their undergraduate journey at IUPUI.